Binh Ba is a 3 square kilometers small island, belong to Cam Binh Commune, Cam Ranh City, Khanh Hoa Province, Vietnam. the island is located in Cam Ranh Bay, Nha Trang city about 60 kilometers to the south, from Ba Ngoi port (Cam Ranh) go 15 km to the east. 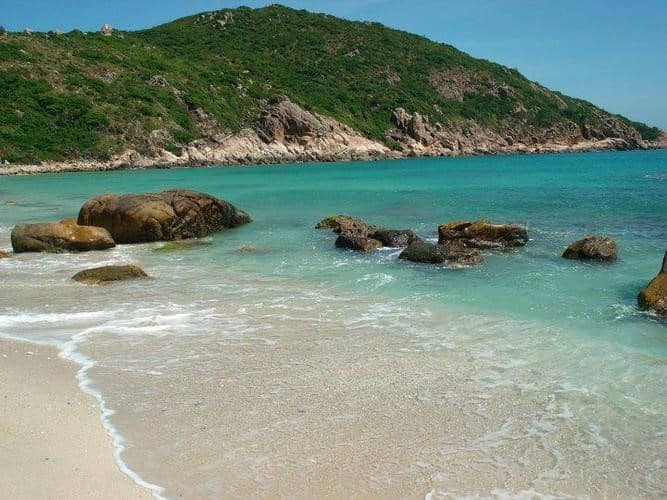 Khanh Hoa was favor by mother nature when when it has a beautiful beaches that can easily fascinate people. Instead of play all day at the coastal town of Nha Trang and enjoy 2 hours on the sea, you will have another choice - it's Binh Ba island, windshield of Cam Ranh Island. It is also known as lobster island because it's known for seafood, especially lobster, which is made into a variety of exotic dishes. If you want to take the boat to the island, tourists come from Ba Ngoi port. Along the way, visitors can freely enjoy the views overlooking Cam Ranh Bay. The dry season starts from November to April of the following year (or up to June) is particularly appropriate time to travel to Binh Ba, by this time the sea is blue and calm, and not affected by the storm. Binh Ba Island has many beautiful beaches: Chuong beach , Nom beach, Bo de beach, Nha Cu beach, Me beach... If you decide to have meal at night on the island, tourists often choose the time from 21h onwards. As different from bustling and sleepless Saigon, the rhythm of the people living on the island is quite peaceful. They bed early to prepare for the voyage the following day. 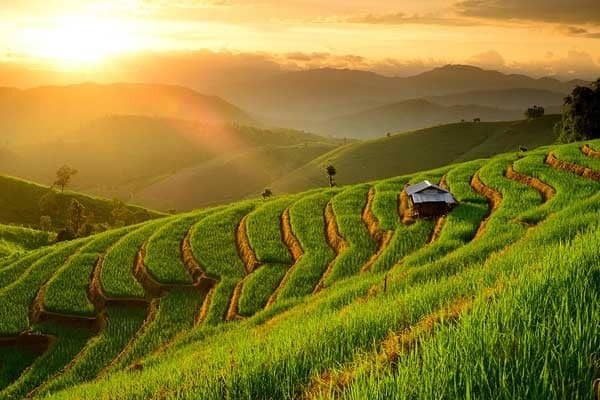 Chiang Mai terraces is listed in the top 10 spots visitors should definitely try to set foot when they travel to Thailand (top 10 include other landmarks such as the city of Phuket, Pattaya, Khao Sok National Park, waterfall Klong Rolling,..). It is located in the north of Thailand, takes about 10 hours from the center of Bangkok to visit the region on the outskirts of Chiang Mai city if traveling by bus. Tourists come here to see the wide terraces enough to overwhelmed their feeling. Along with terraces in Ha Giang, Sa Pa... Chiang Mai (Thailand) is a desirable destination in life for any travel-lover. Chiang Mai city's suburbs, especially in the areas of local farming is home of many ethnic groups. They divided into small villages, and scattered around the terraced fields to care and harvest. The most famous are Tong Luang and Karen. If Tong Luang allow tourists to experience immersing in the green of the terraced or refreshing in the middle of tea hills, the Karen will make you extremely surprised when people here have very long necks with full of necklaces made of gold or copper. Marina Bay is known as the "capital of light" or "visual path of Singapore - the Island country of lions". 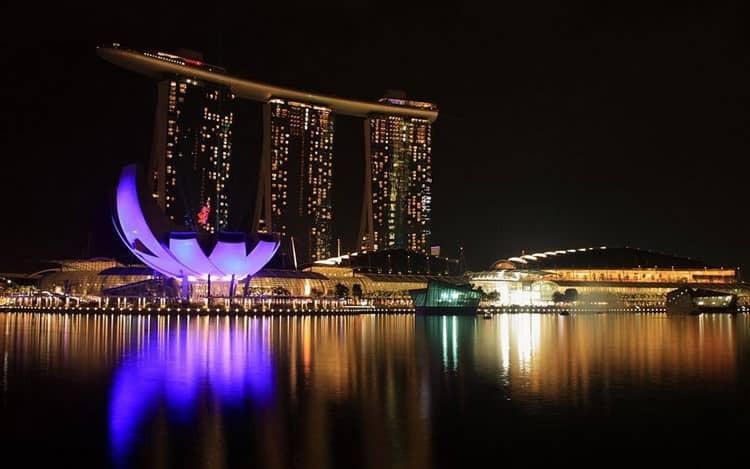 If you choose Marina Bay as the place to stop for exploring, you should visit and have fun in the evening. This is the most crowded time of the day in Marina with lots of unique entertainment activities together with surprisingly beautiful colors from the light emitted from buildings and shopping malls. Marina Bay is a tourist hot spot of Singapore, the country has earned a lot from service. This is the place that is always chosen to held festival and other big events. Marina Bay also satisfied shopping-addict person with thousands of shopping mall area lie across the region. Some of the famous places are Marina Square, Suntec City Mall ... here you can find a handcrafted purse or prom dresses, handmade souvenirs with the characteristics of the island. If you feel overwhelmed by the magnificent capital light or busy urban place, the Nine Oasis - one of the 10 best places to travel to Japan will satisfied. Nine Oasis is a small island located at the southern land of Japan. 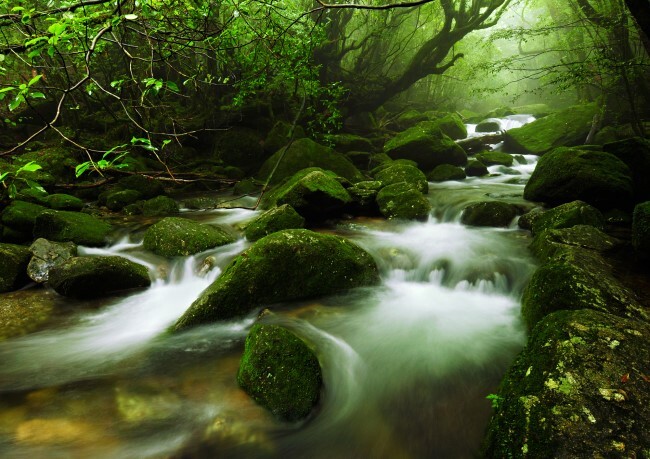 Island also known as Yakushima, Kagoshima district, Kyushu province. With an area of 580 square kilometers, the oasis show up the image of the island national park by a large cover of vegetation here.